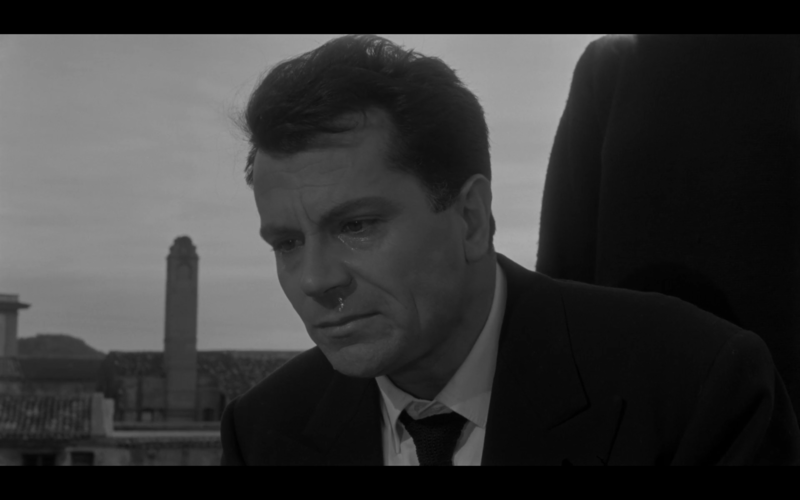 The day after I first saw L’Avventura, I woke up thinking of art, complexity, ambiguity, the iconicity of a face and the complexity of a touch. 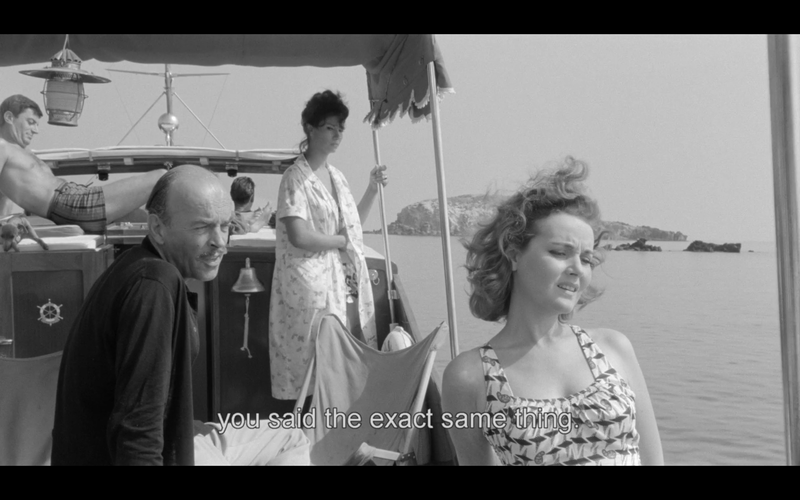 As the film starts, two women – Anna (Lea Massari) and Claudia (Monica Vitti) are setting off on a café society cruise around the coast of Sicily with a group of the louche and the bored, including Anna’s boyfriend, a flash society architect called Sandro (Gabriele Ferzetti). Anna’s father, an elegant slightly weary former ambassador (Renzo Riccci), urges her not to go; Sandro is unworthy and is never going to marry her, he tells her. She, however, insists. He seems accepting of the fact that they might be sleeping together but is sad about it, as if he both mourns and is resigned to the degradation of the daughter he loves. Anna is in love. But it’s a long distance relationship. She’s not getting enough attention from Sandro when they are together and the lack of attention makes her doubt his love. Once on the yacht, she first jumps in the ocean — which leads him to jump in after her — and then lies about being in danger from sharks, which gets everyone’s attention. However, when she actually does disappear on the island, it takes her friends a while to discover it. The people on the cruise are jaded aristocrats for whom the superficial is a shield from oblivion. They’re attentive to spaces in which to quote Oscar Wilde quips, busy only with trying to fend off boredom, and clutching at sensation as a means of keeping being in constant tension with nothingness. Even the possible death of one of them doesn’t really exercise them. They’re afraid of wasting time but what have they to do? After tired and half-hearted attempts to search for Anna, they all go back to more exciting places to be bored. Only Sandro and Claudia persist in their search. In so doing, they’re thrown together and begin to fall for each other. There’s a wonderful moment in the train where Claudia, who has already begged him to leave her alone, emotionally articulates the moral morass of their engaging in a relationship when Ana’s only been missing for a few days and whilst her whereabouts remain unknown, no matter that they’re each now in love with the other. He, however, can’t resist following her onto the train to continue with the chase. Why should he sacrifice himself? He thinks it an idiocy. Why? And for whom? He doesn’t meant to sound cynical but isn’t it better that they face things as they are, i.e. Ana’s no longer there, he no longer cares for his previous love. He’s only interested in his new one. He wants his pleasure. It’s all he can ever think of. Now. Why doesn’t she? As she flees Sandro, the camera cuts to a the waves crashing onto the shore, the camera indicating the inevitability of Claudia’s involvement with Sandro by panning through the relentless waves and settling onto Anna’s face (see clip below). On the soundtrack we then hear a young man courting a young woman in a compartment as Sandro re-enters the shot and gets close to Claudia. Clearly this young working class couple is being aligned and juxtaposed to Claudia and Sandro. The young man knows somebody that works with the young girl and has heard she’s sensible. He has a Chinese transistor radio. Does she like music? She does? And what does she think is more important music or love? She thinks music; he opts for love first. Claudia’s involvement with Sandro is now inevitable. Our new couple is surrounded by extra-diegetic music, soft but dissonant and adding to the alienation evident even in their moment of connection. She soon begins to act as needy as her friend. Anna’s absence is a structuring one. Claudia and Sandro might momentarily forget that their love is founded on a disappearance, an absence, possibly a death. When the absence becomes felt — which it does, first intermittently, then more insistently — this new adventure, so full of promise, is already over. Or is it? The one human moment of connection comes in the very last shot. She’s caught him cheating, he cries, he can’t help himself; dissolute, unfocussed, undisciplined, he’s no more able to be faithful than he was to choose art over a house in Milan AND one in Rome. But does she accept this? 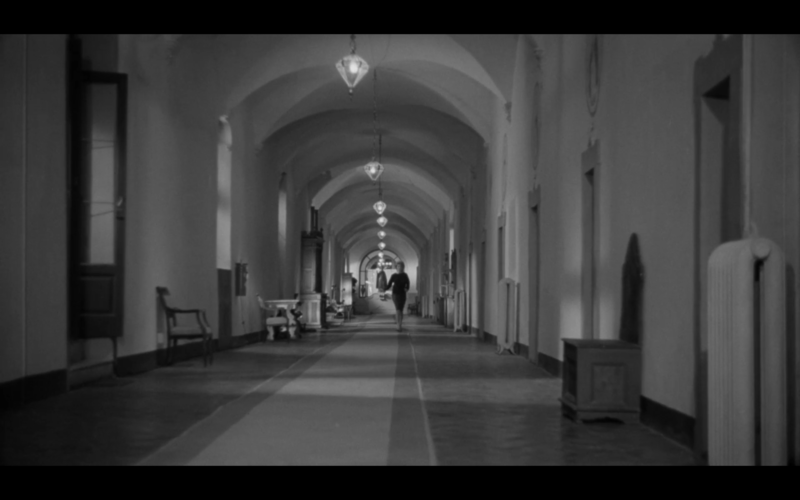 L’Avventura has to have some of the most beautiful compositions in the history of cinema. The seas are raging but the compositions are elegant, classic, balanced; the images they contain are also extraordinary; modernity in the foreground with Balenciaga dresses and sixties kitten heels, Roman ruins and imposing palaces and churches, or simply the natural sublime as background. The images in motion evoke process, tension, a spark of contradiction, which the beauty of the compositions then contains, fixes, naturalises. When Monica Vitti runs in search of her lover, the echoing click of her heels alone evokes a displacement, an alienation, a longing for which the virgin in the background is no help and one that dissipates into solitude even as her heels clack their presence onto parquet. There are niggles: the scene with men chasing after Gloria Perkins (Gloria de Poliolo), the celebrity with the torn dress working publicly in journalism but privately whoring herself to whomever can pay. The threat of the old, the poor, the male and the South as presented by the men gather around Monica Vitti in the extraordinary scene in Palermo. Is the North being patronising to the South? Are the filmmakers crudely commodifying the working class, peasants, Southerners? 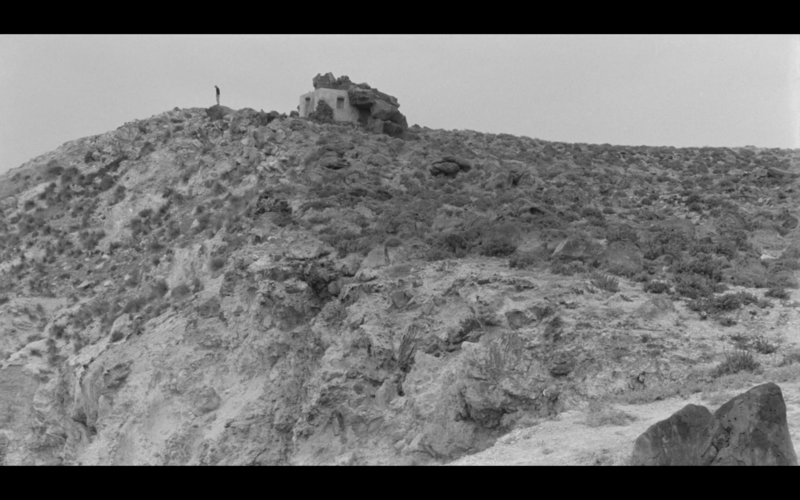 Is Antonioni being critical or making a crude self-serving nod to neo-realist traditions. I don’t know. 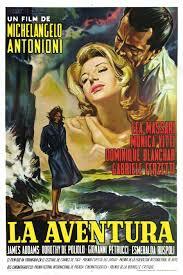 What I am sure of is that L’Avventura is very great film by a truly great filmmaker. Days after I saw it I kept thinking about the beauty of its images and of how mesmeric and impactful Vitti’s final strokes of Ferzetti’s head are. I can’t imagine what its effects would be like on a small screen, though the Criterion transfer is a gorgeous one indeed. See it on as big a screen as you can; it’s worth it even if only for the added pleasure of seeing Monica Vitti’s unforgettable face in as large as size as possible.